Just when we thought the idea of a new football stadium in Los Angeles was completely dead, this just in. The Pasadena Star News reported that the City of Industry is planning to begin grading land for its proposed $800 million stadium, developed by Majestic Realty and designed by architect Dan Meis, who now works for Woods Bagot. The stadium—which now has its own web site—would have general seating dug into a hillside, and would contain a large entertainment district. Majestic's lease requires the city to build the stadium's infrastructure, "regardless of whether the stadium proceeds." And so "rough grading," filling in valleys and lopping off hills on the site, will begin. Whether it eventually serves a stadium or an industrial commercial center (another proposal for the site) remains to be seen. 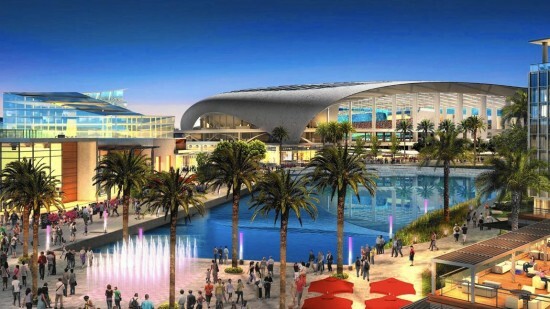 For now no team has agreed to move to Los Angeles, let alone to use this stadium. 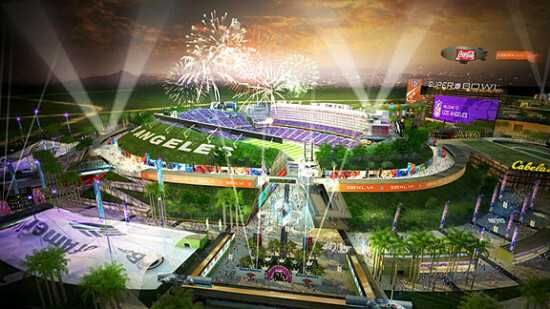 Another competitor, Farmers Field, designed by Gensler for AEG, is also on hold pending a team's move to Los Angeles.